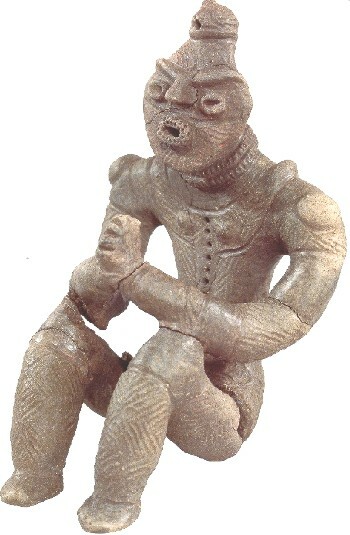 Ancient Homo-sapien-sapiens (Modern Man), began to leave Africa about 70-60,000 B.C. There were two great migrations east; the first occurred about 70-60,000 B.C. This group followed a coastal route and eventually reached Australia. 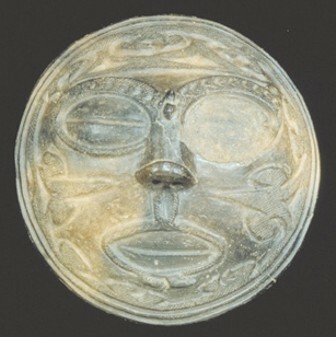 The second wave of migration occurred about 60-50,000 B.C. 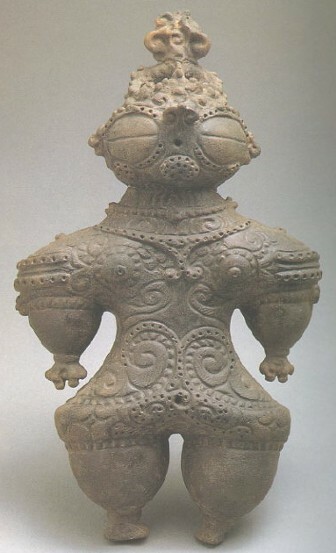 These may have been big game hunters who followed an inland route in search of game; they reached China by about 50-45,000 B.C. 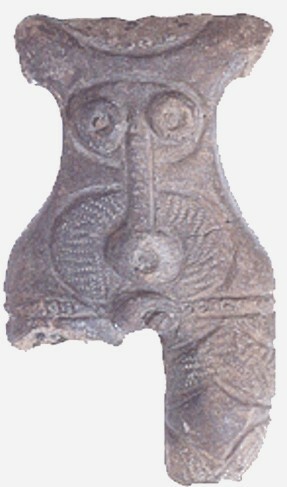 By around 40,000 B.C. glaciation had connected the Japanese islands with the Asian mainland. 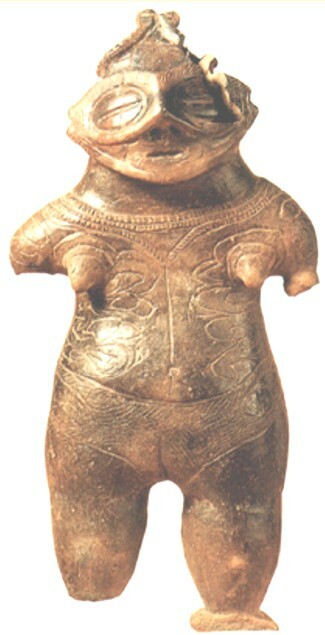 Based on archaeological evidence, between 35,000 B.C. 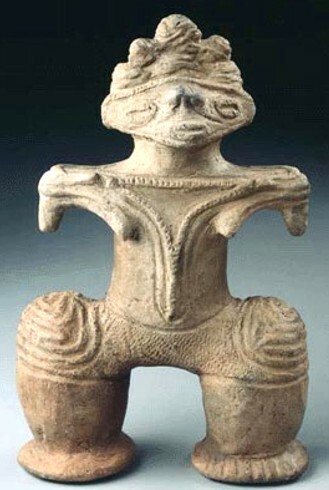 and 30,000 B.C, these Homo sapiens- sapiens had migrated to the Japanese islands from eastern and southeastern Asia. 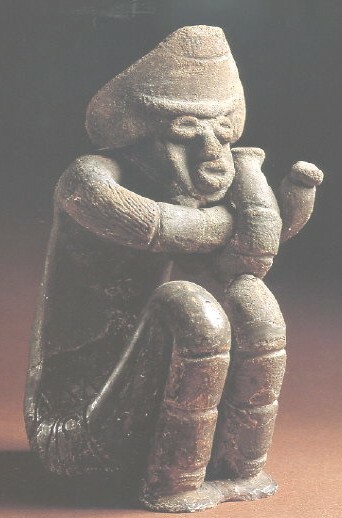 There they had well-established patterns of hunting and gathering and stone tool making. 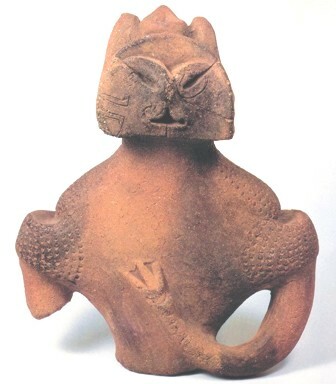 Stone tools, inhabitation sites, and human fossils from this period have been found throughout all the islands of Japan. 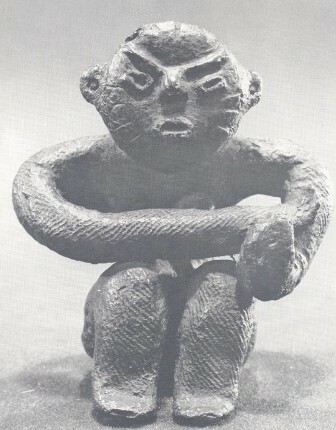 Two ancient Japanese cultures evolved from these early settlers, the Jomon and the Ainu. 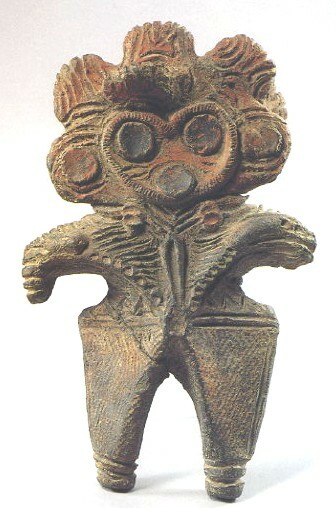 The Jomon culture, which encompasses a great expanse of time, constitutes Japan's Neolithic period. 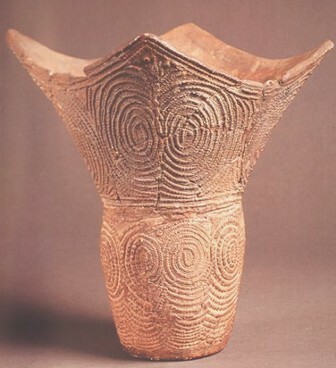 Its name is derived from the "cord markings" that characterize the ceramics made during this time. 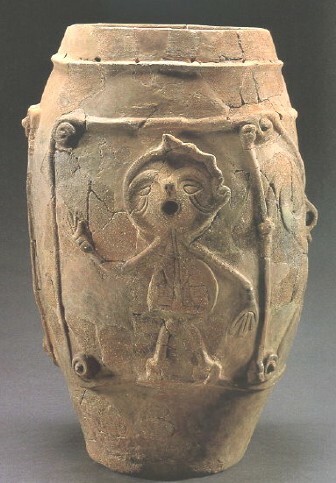 The early Jomon people were semi-sedentary, living mostly in pit dwellings arranged around central open spaces, and obtained their food by gathering, fishing, and hunting. 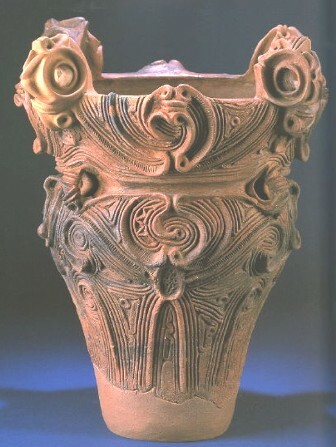 All Jomon pots were made by hand, without the aid of a wheel, the potter building up the vessel from the bottom with coil upon coil of soft clay. 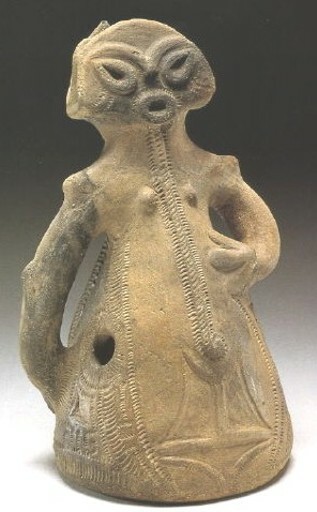 As in all other Neolithic cultures, women produced these early potteries. 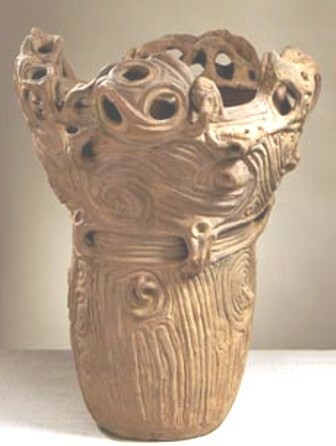 The clay was mixed with a variety of adhesive materials, including mica, lead, fibers, and crushed shells. 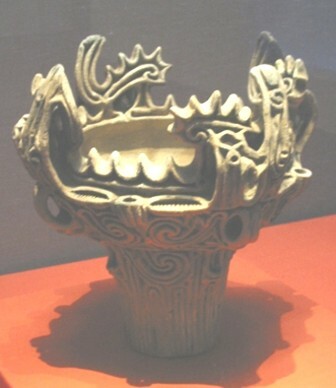 After the vessel was formed, tools were employed to smooth both the outer and interior surfaces. 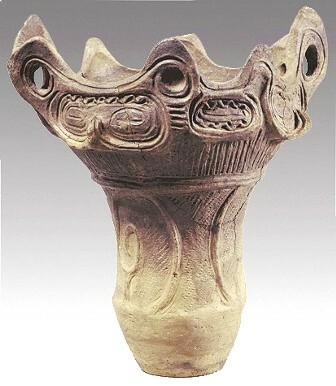 When completely dry, it was fired in an outdoor bonfire at a temperature of no more than about 900 C.
This period marks the transition between Paleolithic and Neolithic ways of life. Archaeological findings indicate that people lived in simple surface dwellings and fed themselves through hunting and gathering. 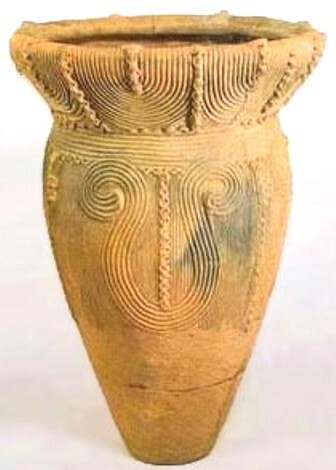 They produced deep pottery cooking containers with pointed bottoms and rudimentary cord markings—among the oldest examples of pottery known in the world. By this period, the gradual climatic warming that had begun around 10,000 B.C. sufficiently raised sea levels, so that the southern islands of Shikoku and Kyushu were separated from the main island of Honshu. The rise in temperature also increased the food supply, which was derived from the sea as well as by hunting animals and gathering plants, fruits, and seeds. Evidence of this diet is found in shell mounds, or ancient refuse heaps. Food and other necessities of life were acquired and processed with the use of stone tools such as grinding rocks, knives, and axes. 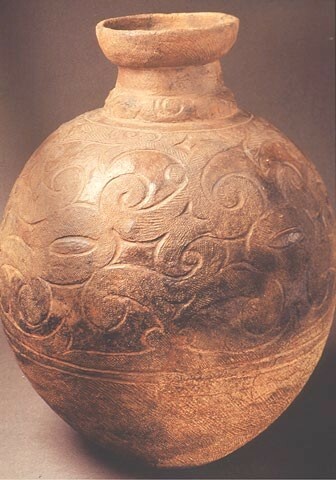 The contents of huge shell mounds show that a high percentage of people's daily diet continued to come from the oceans. 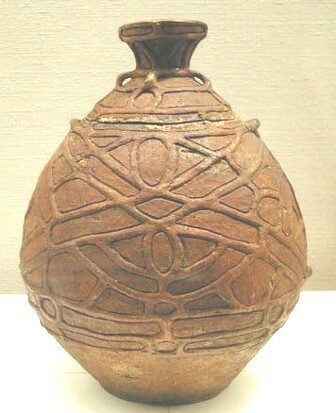 Similarities between pottery produced in Kyushu and contemporary Korea suggest that regular commerce existed between the Japanese islands and Korean peninsula. The inhabitants of the Japanese islands lived in square-shaped pithouses that were clustered in small villages. 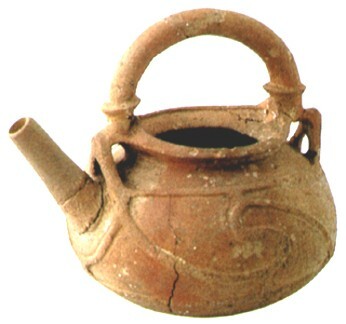 A variety of handicrafts, including cord-marked earthenware cooking and storage vessels, woven baskets, bone needles, and stone tools, were produced for daily use. 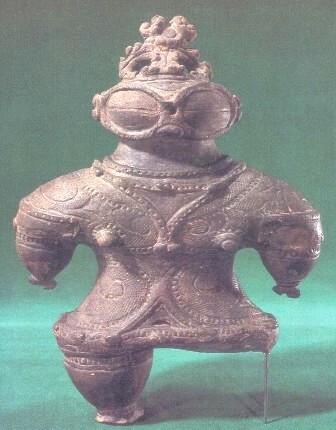 This period marked the high point of the Jomon culture in terms of increased population and production of handicrafts. 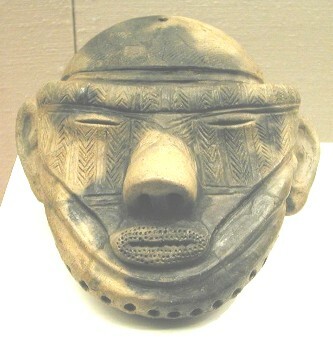 The warming climate peaked in temperature during this era, causing a movement of communities into the mountain regions. Refuse heaps indicate that the people were sedentary for longer periods and lived in larger communities; they fished, hunted animals such as deer, bear, rabbit, and duck, and gathered nuts, berries, mushrooms, and parsley. 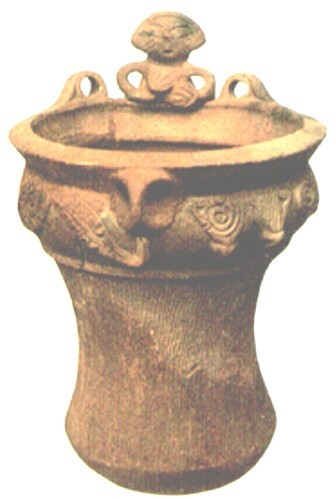 Early attempts at plant cultivation may date to this period. 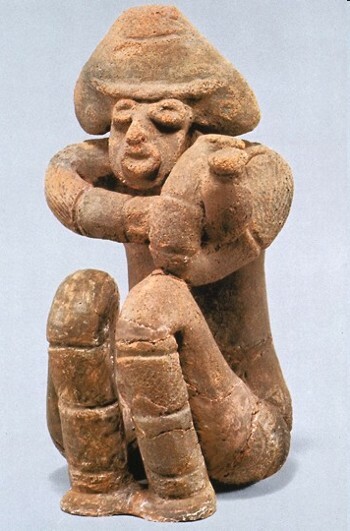 The increased production of female figurines and phallic images of stone, as well as the practice of burying the deceased in shell mounds, suggest a rise in ritual practices. As the climate began to cool, the population migrated out of the mountains and settled closer to the coast, especially along Honshu's eastern shores. Greater reliance on seafood inspired innovations in fishing technology, such as the development of the toggle harpoon and deep-sea fishing techniques. 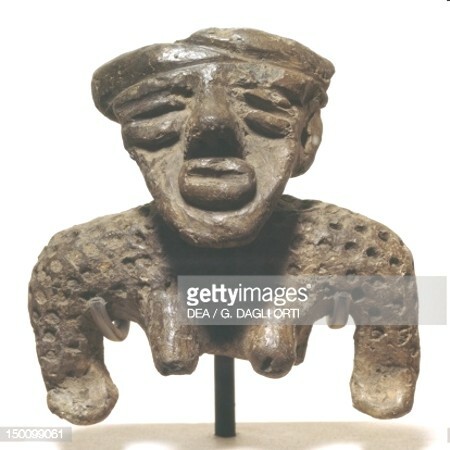 This process brought communities into closer contact, as indicated by greater similarity among artifacts. 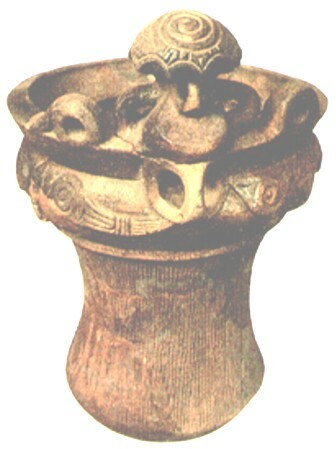 Circular ceremonial sites comprised of assembled stones, in some cases numbering in the thousands, and larger numbers of figurines show a continued increase in the importance and enactment of rituals. 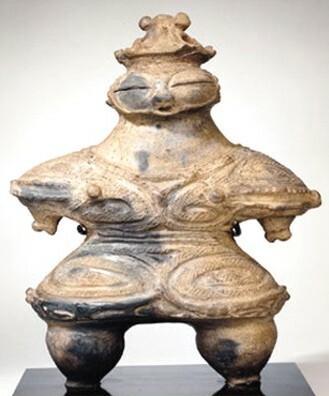 By about 350 B.C, a Mongol group called the Yayoi, (the progenitors of modern Japanese) migrate from China and invade, conquer and destroy the Jomon civilization. 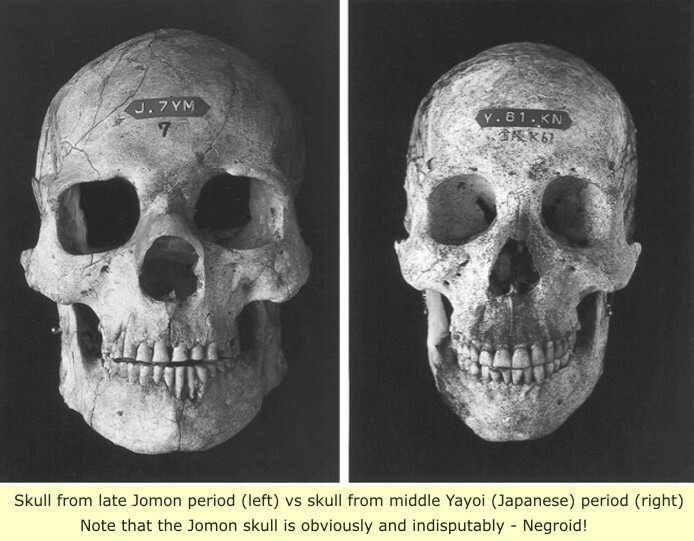 The Jomon people do not exist today, however it is likely that because of crossbreeding, their genes exist in today’s Japanese. Genetic testing has shown them to belong mainly to Y-haplogroup D-M55. 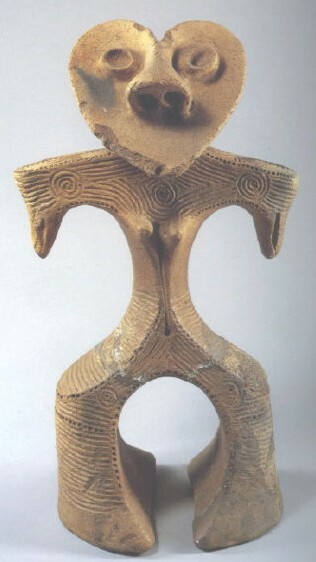 Y-DNA haplogroup D2 is found frequently throughout the Japanese Archipelago including Okinawa. The only places outside Japan in which Y-haplogroup D is common are Tibet in China and the Andaman Islands in the Indian Ocean. Based on analysis of one sample of 51 modern Ainus, their mtDNA lineages have been reported to consist mainly of haplogroup Y (21.6%), haplogroup D (17.6%), haplogroup M7a (15.7%), and haplogroup G1 (15.7%). 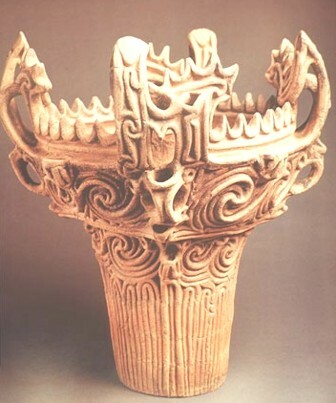 See: Prehistoric America and China2 sections for material on the Ainu.